It took a while, but Russell Westbrook has come on so strong lately that he’s vaulted himself into the NBA’s Most Valuable Player conversation as one of the top candidates for the coveted award. Just one season after Westbrook’s Oklahoma City Thunder teammate Kevin Durant won the award, Westbrook could very well end up with it, which would be only the second time in league history that teammates won the award in back-to-back seasons. The only other time was Bob Cousy and Bill Russell for the Boston Celtics back in 1956-57 and ’57-58. Both Westbrook and Durant were injured for the 14 games December, a span that saw OKC lose 10 times. Westbrook has played every single other game, however, typically logging at least 33 minutes. Durant has missed an additional 15 games and is going to miss at least another week due to injury. Without Durant, the Thunder have managed to go 9-6–largely because Westbrook has taken over games with his aggressive scoring and playmaking. On November 28 against the Knicks, in the first game Westbrook played in without Durant this season, he scored 32 points on 12-17 shooting, dished out 8 assists, and collected 7 rebounds. On Christmas Day, in a win over the Spurs on the road, Westbrook scored 34 points on 14-28 shooting, fished out 11 assists, collected 5 rebounds, and also recorded 5 steals. In one of the latest wins without Durant, over the Hornets on February 21, Westbrook scored 33 points on 12-27 shooting, dished out 10 assists, and grabbed 7 rebounds. Westbrook is second in the league in scoring, at 26.1 points per game, fifth in the league in assists, at 8.0 per game, and second in the league in steals, at 2.1 per game. Westbrook’s impact on his team is high. 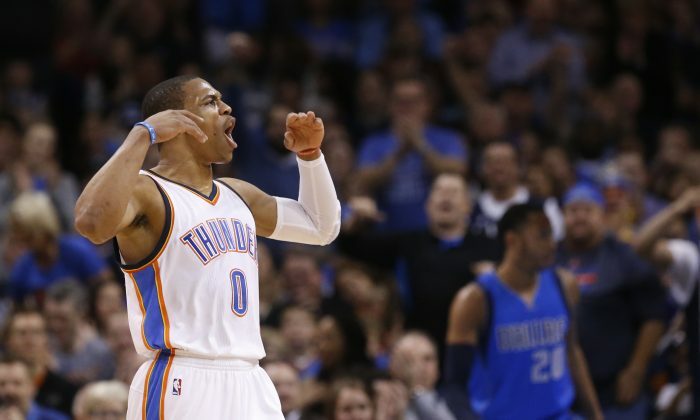 When he’s on the court, the Thunder has a +7.7 net rating, including a torrid 109.0 offensive rating. When Durant and Westbrook are both on the court, the Thunder are +9.0–but even when Durant is off, the Thunder are +6.0, good for fifth in the NBA. Other advanced statistics bear out his monumental effect while on the floor. Westbrook is second in the league in Player Efficiency Rating (PER) at 29.24, just behind Anthony Davis of the Pelicans and ahead of top MVP candidates Harden, Curry, and James. The rating measures a player’s per-minute productivity. 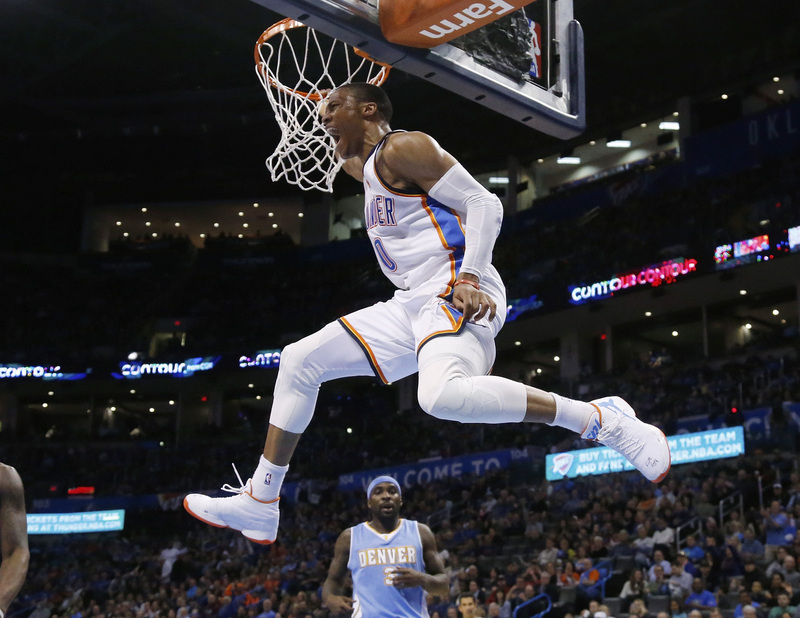 What’s most noticeable is how Westbrook is playing better as the season progresses. Through 10 games in February, Westbrook has been averaging 30.6 points, 10.1 assists, and 7.9 rebounds while shooting 39 percent from 3-point range and almost 50 percent overall. He’s also getting to the free throw line a little over 10 times a game and nailing 92 percent from the charity stripe. His explosion this month included back-to-back 45 point and 48 point games against the Pelicans, one without Durant, in which the Thunder went 1-1. But the team hasn’t lost any other games in February, even with Durant missing three other games. The Thunder as a team are in an even better position thanks to the multiple trades made just before the trade deadline. And new teammates D.J. Augustin, Kyle Singler, Steve Novak, and Enes Kanter have noticed how much of an impact Westbrook makes. Westbrook winning the MVP would be unusual at this point, though, even with the Thunder all but assured of a playoff spot after the Goran Dragic trade and Anthony Davis injury. Team success is a big part of the deal, and whiel Westbrook has spurred OKC to a nice record without Durant, it might not be enough. Of the last 30 MVP winners, the majority of their teams had winning percentages of over .700 percent, with only five below that and none below .600 percent. The Thunder could reach .610, but it would mean a large amount of wins over the home stretch. Westbrook wouldn’t win the MVP award if the season stops today, but if he keeps up his strong play and helps the Thunder win more games without Durant, he could eventually surpass the leaders in the conversation.